The Alexis Elsa Top radiates with a botanical motif that brings to mind spring's inaugural blooms. 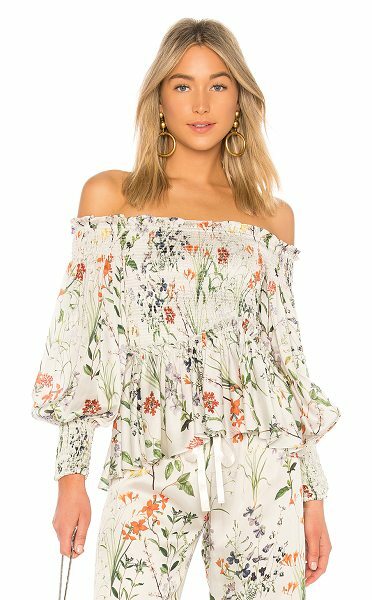 The smocked bodice sits daintily off the shoulders while a rippling peplum hem finishes the feminine look.. Self: 100% polyLining: 95% poly 5% elastane. Dry clean only. Smocked bodice. Ruffle trim. Flounce hem. AXIS-WS211. ELSA. A luxurious clothing line born out of Miami and brain child of designer Alexis Barbara, the collection is influenced by Mediterranean travels and designed for those who are delicately sophisticated and truly fashion forward.